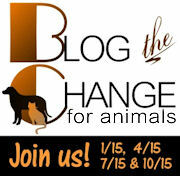 Back in October 2010 I participated in the Blog the Change for Animals for the first time. The city council in Richmond, B.C. had just agreed to pass a by-law banning the sale of dogs and puppies in pet stores, which is an important step in curbing the puppy mill industry. In my post, my first point for how the average person can easily help combat puppy mills was to canvass your local government to implement a similar ban in your city. And that got me thinking: I should practice what I preach! Calgary, while a remarkable city in many ways when it comes to Animal & By-Law Services, currently does not have such a ban in place or any other restrictions that would help to prevent puppy mill sales (i.e. required breeding licensing, for example). And I think it should. Such a ban will help prevent both impulse pet purchases in pet stores and puppy mill pet sales. It will also help ease the strain on local rescue organizations, with statistics coming from Albuquerque, New Mexico that show a 23% increase in shelter adoptions and a euthanasia decrease of 35% only a few years after enacting their ban. Four days later I sent my letter to Mayor Nenshi and all council members requesting consideration of a ban in Calgary prohibiting the retail sale of companion animals (specifically, both dogs and cats). I e-mailed, I faxed, I posted my letter online and I literally received zero response from anyone. A big fat goose egg. Not even a form “thank you for showing an interest in your local government, now PFO”. I waited a couple of weeks and re-sent my letter. Well, not entirely. Someone did notice, and that someone was Corporate PetLand. I went back and forth with the nice folks over there for a while on the issue, and even that has since died off. In fact, my goal for 2011 is to band together with a group of like-minded individuals and hopefully generate a higher profile voice that won’t get filed in the city’s shredder. Because while I truly enjoyed discussing the issue with the PetLand representatives and learning about their opinions on this subject, I remain to be convinced that this is a detrimental approach to the problem. In fact, since I initially wrote my letter in October, Austin, Texas has enacted a similar ban of its own. St. John’s, Newfoundland’s council has also received a proposal for a similar ban, and there is a group actively advocating for a ban in Toronto as well. More locally, a St. Albert store, Paradise Pet Centre, has voluntarily ceased selling dogs and cats (after 30 years of retail pet sales) in order to encourage rescue adoptions. If all other pet stores were similarly minded, I wouldn’t have to be writing this. Unfortunately, they’re not, so implementing a ban will essentially force compliance for the benefit of the animals. I’m okay with that. Calgary has recently taken a number of steps to help curb pet overpopulation, including a spay/neuter assistance program and the national 2011 Year of the Cat initiative that focuses on responsible pet ownership to combat the ever-increasing population of unwanted cats in shelters and rescue organizations. With the acknowledgement that there is an abundance of homeless, unwanted or rescue animals within the city, it seems logical that retail pet sales only add to the problem. Instead of commercially purchasing a new pet, there are more than enough out there in need of adopting. In fact, retail pet sales actually add to the unwanted pet population when pets purchased on an impulse later get surrendered. So if you agree that there are enough companion animals out there already in need of homes without the consideration of commercial pets sales, and want to help prevent puppy mill sales and impulse pet purchases, I ask you to join me (or begin a similar campaign in your own city or municipality). – Send a letter to Mayor Nenshi and your Alderman (or all of city council), asking them to consider and implement a ban on retail pet sales. – Spread the word and help create buzz. Animal advocacy is (sadly) not the “sexiest” political issue out there, so extra effort is required to create headlines and achieve results. Tell your friends and anyone you know in the pet industry who is willing to speak out (trainers, groomers, rescues, etc.) and advocate a ban – get the industry behind us! – Don’t shop at the stores that do sell pets; if they get the message and willingly opt to feature shelter adoptions rather than sell pets, then we don’t even need said ban. Win-win! – Know anyone looking for a new family member? Promote adopting a rescue dog or thoroughly researching reputable breeders. – Don’t be discouraged. It’s hard, but a worthy cause. Help prevent puppy mills and homeless pets! 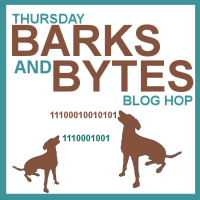 In March 2010, Valerie Berenyi of the Calgary Herald Blog My Dog Sez wrote advocating a ban on the sale of dogs in retail outlets. If you’re not going to listen to some unknown blogger like myself, listen to her. 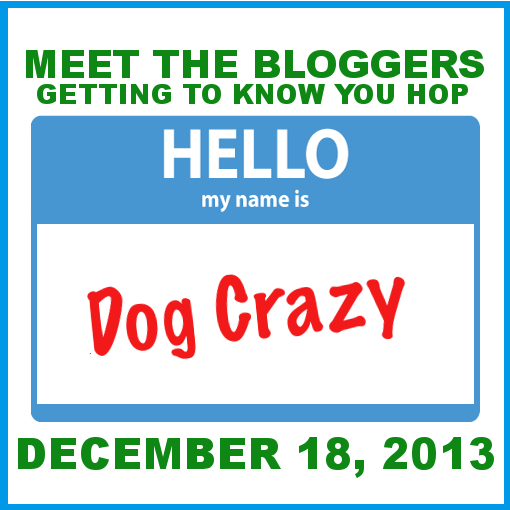 As I appear to be technologically challenged and cannot get the blog hop list to appear properly, please visit the Blog the Change website to see the list of other participants in the BtC event, visit their blogs, and read about their causes. 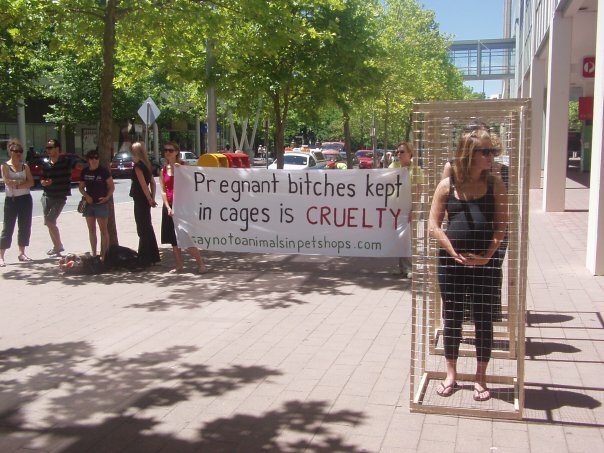 While perusing the ‘net on typical topics of interest, I came across this photo of protestors demonstrating against puppy mills and the sale of pets in pet stores. What are your thoughts/reactions to this comparison? Clever? Sensationalist? Misguided? I, of course, appreciate the cause and the underlying sentiment, but have always personally been one to prefer rational discussion and logical argument. Unfortunately, that strategy rarely gets headlines, so maybe these folks are on to something after all. Just taking a quick moment to update on recent happenings within the subject of pet sale bans: Austin, Texas, with a 7-0 vote today has become the latest city to pass such a ban. The ban prohibits the sale of dogs and cats in pet stores, as well as other public areas, with exceptions for rescue organizations and regulated “pet traders” (otherwise known as breeders) who sell more than 15 dogs or cats in a year. It also adds further requirements for pet traders, such as the provision of microchipping or any relevant spay/neuter information. While this sounds like a big step, the proposed ordinance actually largely just amends ones already in place in Austin – aside from the addition of a complete retail ban – making regulation of pet traders more efficient and enforceable, and imposes penalties for violators. As it turns out, Austin is already rid of stores selling companion animals; PetLand, the last store standing, closed earlier this year. And the ultimate goal of Austin’s city council in enacting this legislation? For those who like math, they’re looking at a 37% decrease over the next year or so. So, apologies to all who are sick of hearing me say it but: Calgary should be next! I mean, c’mon. Even the capital of America’s most proud, freedom loving state has prohibited retail pet sales. This month, Richmond, B.C. became the first Canadian city to agree to ban the sale of dogs and puppies in pet stores. The by-law is expected to be finally adopted in November and take effect April 30, 2011. While pet shop owners who financially benefit from these sales may not be impressed, this is an important step when taking action against puppy mills. We Canadians are actually behind our neighbours to the south in this respect, with many American cities having long ago banned the sale of puppies in pet stores, including cities in California, Florida, New Mexico and Missouri. How does this help? Well, pet stores are just one of the many mediums through which puppy mills are able to sell their puppies. And I should note, there is a similar concern about “kitten factories”, as well. While many puppy mills still flourish through online sales, banning the sale of puppies in pet stores remains an important step in prevention and public awareness. 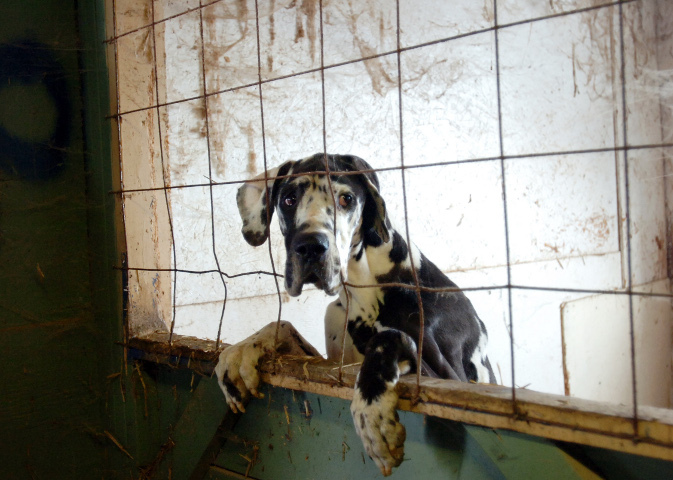 What is a puppy mill and why is it bad? Well, essentially a puppy mill (or kitten factory, for that matter) is a high-volume breeder. Dogs are bred in sub-standard and inhumane conditions, often in dirty, cramped kennels, literally living in their own feces. The parents (the “breeding stock”) experience zero socialisation with other animals or human beings, and are malnourished and over-bred. There is no concern for hereditary health conditions or inbreeding; the goal is to produce and sell as many puppies as possible. Look it up – horrors will make your stomach churn. The products of these puppy mills – the puppies often seen in those pet store windows – are yes, an extremely sad case, but not an ideal pet. These puppies are taken from their mothers long before the recommended age of 8-10 weeks, to ensure they are still adorable for those window shoppers. This early removal results in numerous potential behaviour problems. In addition, the squalid conditions they are born in and the disregard for proper breeding standards often result in serious undiagnosed and hereditary medical health problems. While bans like the one in Richmond do not completely prevent the problem, they are a significant step. They create awareness, put a dent in puppy mill sales, and often allow rescue organizations to fill the void and adopt out more dogs. These bans also prevent the “impulse purchase” of companion pets, effectively – I believe – preventing many instances of bad owners and animal cruelty in private homes. Owners who did not properly think through their purchase and what they were getting into are a large supplier of rescue dogs in the first instance. So what can you do? Lots! 1. Lobby your local government (i.e. city council) for bans similar to those in Richmond, B.C. Lobby your federal and provincial government for better regulation of commercial breeders and stronger animal cruelty laws. 2. If you’re considering a pet, look for a reputable breeder or seek out a rescue organization. Reputable breeders and many rescue organizations will make you fill out long applications and interview you before determining whether or not you’re a suitable candidate for one of their dogs. This is not a bad thing. If you’re not sure what to look for in a breeder, do some research. There are lots of helpful resources out there. 3. In addition to not buying from a pet store, avoid the other mediums for puppy mill sales – largely the internet and newspaper ads. Be aware of pets sold through Kijiji and similar websites, and always insist on making a location visit prior to picking up your new family member. Ask to meet the puppy’s parents. If they are willing to give you your puppy prior to it turning 8 weeks old (at minimum), walk away. There are lots of puppies out there in need of a good home. 4. Don’t support pet stores that sell companion animals. At all. 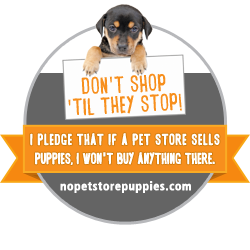 Many pet stores opt to feature pets from local shelters, or just sell supplies – this is great! Give your business to them. 5. Speak up! If you suspect a puppy mill, report it. The Humane Society of the United States actually has a toll free number you can call to report suspected puppy mills: 1-877-MILL-TIP. Don’t let them go unreported. In Canada, make reports to your local SPCA or Humane Society. You can also report suspected cases of animal cruelty to your local Animal & By-Law Services.